This is how you know you're at a premier Catskills resort. A leaking dining room filled with old chairs. 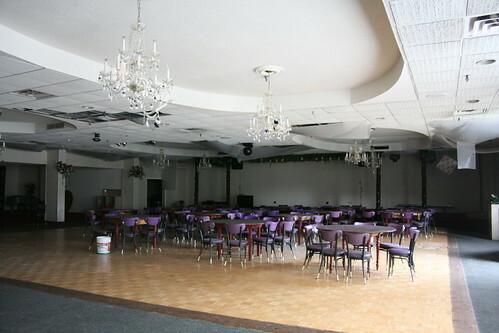 Despite the modernizations (mainly DJ lighting and sound equipment), the purple chairs, which were actually from the Persian Room at the Pines, clashed dramatically with the otherwise drab color scheme in the rest of the room here. However, note that the dance floor has been well kept, to the credit of the owners.